For over 700 years All Saints Church has stood at the heart of this community. A church has stood on this site for about 1,000 years. The present building was constructed in early 13th Century. The Spire Coffee Shop offers homemade cakes and other treats, made to order sandwiches and light hot meals. A church has stood on this site for about 1000 years. The present building was constructed in the early 13th Century. 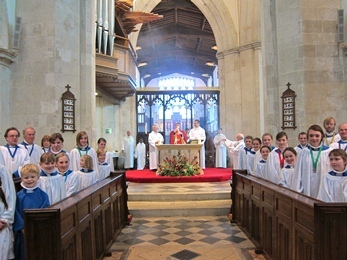 Find out about the regular services held at All Saints Leighton Buzzard. Find out clergy, churchwardens, magazine and other contacts. Music is a large part of the worship at All Saints Leighton Buzzard. Find out more about the Choir and the music for upcoming services. The choir has room for a few more singers. It is a big commitment, but great fun and very rewarding! We sing in church, during weekly services, and at special events such as the Civic service and the Mayor's carol concert. Singing scholarships for all voices and an organ scholarship are offered. We often make day trips to local cathedrals to sing Evensong and every two years we organise a residential cathedral trip and sing the services for a number of days. Last year we spent a week at Lincoln cathedral and in 2018 we shall spend a long weekend at Wells cathedral. If you would like your wedding to be at All Saints Leighton Buzzard, you can find out more here. Find answers to your christening and baptism questions here. Find out about hiring the church or church rooms for your concert or other event.